The term microwaves is used for electromagnetic radiation in the approximate wavelength range of 1 millimeter (mm) (frequency of 300 gigahertz (GHz)) to 1 meter (m) (frequency of 0.3 GHz). They are part of the radio-wave region of the spectrum and lie at the higher frequency end of radio waves. Compared to visible light, microwaves have longer wavelengths and are therefore invisible to the human eye. They can readily pass through the Earth's atmosphere. Microwave technology has been developed so that we can cook food rapidly, sense objects remotely, and engage in global wireless communications almost instantaneously. This technology has thus fostered intercultural exchange and brought the peoples of the world closer together, helping us see ourselves as one family of humanity. James Clerk Maxwell, using his famous "Maxwell's equations," predicted the existence of invisible electromagnetic waves, of which microwaves are a part, in 1865. In 1888, Heinrich Hertz became the first to demonstrate the existence of such waves by building an apparatus that produced and detected microwaves in the ultra high frequency region. Hertz recognized that the results of his experiment validated Maxwell's prediction, but he did not see any practical applications for these invisible waves. Later work by others led to the invention of wireless communications, based on microwaves. Contributors to this work included Nikola Tesla, Guglielmo Marconi, Samuel Morse, Sir William Thomson (later Lord Kelvin), Oliver Heaviside, Lord Rayleigh, and Oliver Lodge. In 1965 Arno Penzias and Robert Woodrow Wilson at Bell Telephone Laboratories in New Jersey built an instrument for radio astronomy and satellite communication experiments. To their surprise, the instrument detected a background microwave noise coming from practically every direction in space, without much variation in intensity. 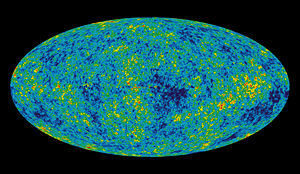 They had discovered what is called the "cosmic microwave background radiation." This radiation has been interpreted to be a remnant of the origin of the universe, and its existence is thought to support the Big Bang model of how the universe may have originated. For their discovery, Penzias and Wilson were awarded the Nobel Prize in Physics in 1978. Microwaves can be generated by various means, generally placed in two categories: solid state devices and vacuum-tube based devices. Solid state microwave devices are based on semiconductors such as silicon or gallium arsenide. They include field-effect transistors (FETs), bipolar junction transistors (BJTs), Gunn diodes, and IMPATT diodes. Specialized versions of standard transistors, developed for higher speed, are commonly used in microwave applications. Microwave devices based on the vacuum tube operate on the ballistic motion of electrons in a vacuum chamber, under the influence of electric or magnetic fields. They include the magnetron, klystron, traveling wave tube (TWT), and gyrotron. A microwave oven uses a magnetron microwave generator to produce microwaves at a frequency of approximately 2.45 GHz for the purpose of cooking food. Microwave ovens cook food by causing molecules of water and other compounds in the food to vibrate or rotate. The vibrations generate heat, which warms the food. Given that food contains moisture, it is easily cooked by this method. Microwaves pass easily through the Earth's atmosphere, penetrating clouds, smoke, and light rain and snow. For this reason, microwaves are used in broadcasting transmissions. For instance, microwaves are used in television news coverage, to transmit signals from a specially equipped van in a remote location to a television station. In addition, they are used for transmissions to and from satellites, and to take satellite images of the Earth. The technology known as radar (an acronym for "radio detection and ranging") involves the use of microwave radiation to detect the range, speed, and other characteristics of remote objects. Wireless communications between various devices—such as computers, printers, digital cameras, and personal digital assistants (PDAs)—rely on microwaves, often in the 900 megahertz (MHz), 2.4 GHz, or 5.0 GHz bands. This type of short-range network is known as WLAN (Wireless Local Area Network). Large, wireless computer networks covering a university campus or city also communicate by microwave transmissions. The communications protocol (standard for data transfer) is known as a wireless MAN (Metropolitan Area Network) protocol, such as WiMAX (Worldwide Interoperability for Microwave Access). For commercial applications, these microwave communications are in the 2.5 GHz, 3.5 GHz and 5.8 GHz ranges. Several mobile phone networks use the lower microwave frequencies. Microwaves are used to generate plasma for many semiconductor processing techniques, such as reactive ion etching and plasma-enhanced chemical vapor deposition (PECVD). A maser is a device in which atoms or molecules are stimulated to amplify and emit a highly focused, coherent beam of microwave radiation. The term maser is an acronym for "microwave amplification by stimulated emission of radiation." Masers are used in atomic clocks and as amplifiers in radio telescopes. Microwaves can theoretically be used for wireless power transmission through outer space and the atmosphere. In the 1970s and early 1980s, NASA worked to research the possibilities of using solar power satellite (SPS) systems with large solar arrays that would beam power down to the Earth's surface via microwaves. ↑ A. A. Penzias and R. W. Wilson, "A Measurement of Excess Antenna Temperature at 4080 Mc/s," Astrophysical Journal 142 (1965), 419. R. H. Dicke, P. J. E. Peebles, P. G. Roll and D. T. Wilkinson, "Cosmic Black-Body Radiation," Astrophysical Journal 142 (1965), 414. The history is given in P. J. E. Peebles, Principles of physical cosmology (Princeton Univ. Pr., Princeton 1993). This page was last modified on 24 October 2014, at 16:13.